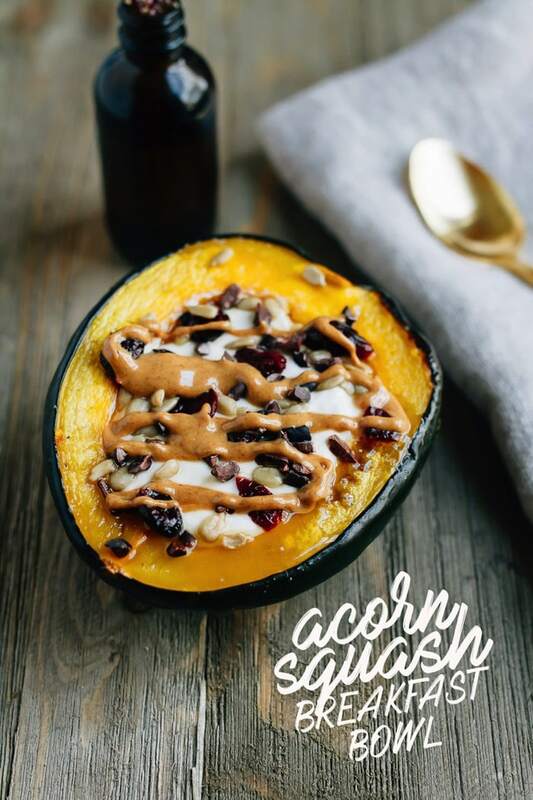 Roasted acorn squash breakfast bowls with yogurt and your favorite toppings! A delicious, comforting breakfast for the fall and winter months. The first time I had an acorn squash breakfast bowl was at my cousin’s house a couple years ago. One morning while I was visiting she roasted up a squash for us to share. We each loaded up one half with yogurt and fun toppings like granola, cinnamon, chia seeds and peanut butter. One bite and I was hooked! I loved the sweet roasted squash topped with tangy yogurt. I immediately decided I needed to share the idea here on EBF. It took me a while (over two years!! ), but I finally have the recipe for you today. 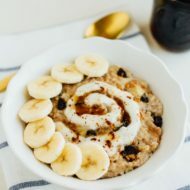 I’m excited because I love bowl meals — especially when they’re edible — and I know you are going to enjoy these acorn squash breakfast bowls too. These bowls are not only gorgeous and fun to put together, but they’re healthy, satisfying and will definitely keep you feeling full until lunch. With the protein from the yogurt, complex carbs from the squash and a little fat from the toppings, you’re set! Plus, you get bonus health points because eating a vegetable for breakfast! The bowls are super customizable. You can use whatever yogurt you prefer and the topping options are limitless. I used Siggi’s plain sykr and then added dried cranberries, cacao nibs and sunflower seeds, plus a drizzle of both maple syrup and almond butter. This combo was heavenly! 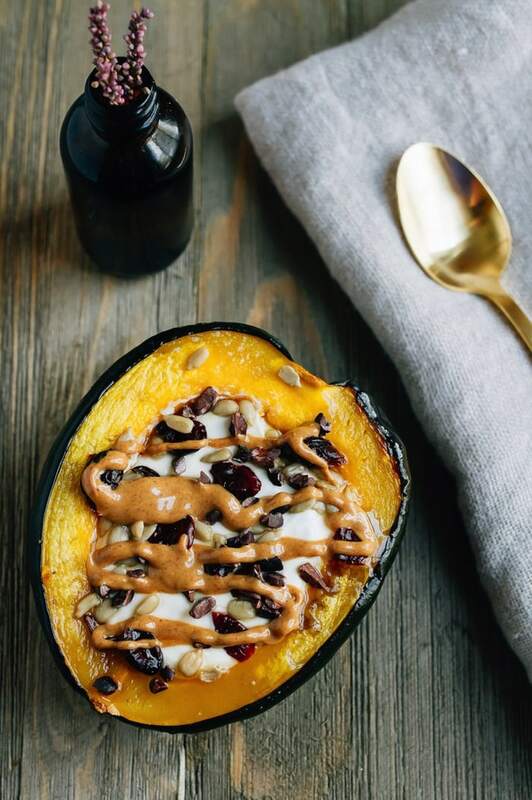 When it comes to putting the acorn squash breakfast bowls together, you can use freshly roasted acorn squash that’s cooled for a few minutes or re-heat pre-roasted squash to make the prep faster. Another option is to roast and chill the acorn squash, but I prefer it warm. It’s the perfect way to enjoy yogurt through the fall and winter months when a traditional yogurt bowl seems too cold. 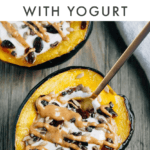 If you make these acorn squash breakfast bowls with yogurt be sure to leave a comment and star rating below letting us know how it turned out. Tag your creation on instagram with @eatingbirdfood and #eatingbirdfood. Your feedback is so helpful for the EBF team and our readers! toppings: dried cranberries, cacao nibs, sunflower seeds, maple syrup, almond butter, etc. Preheat oven to 425°. Cut acorn squash in half, scoop out seeds and discard (or save for roasting). Spray a baking sheet with cooking spray or rub a little coconut oil over sheet. Slice a small piece off bottom of each squash half just enough to level. Rub a little coconut oil over the flesh of each half and sprinkle with cinnamon. Set squash halves, cut side down, on prepared sheet. 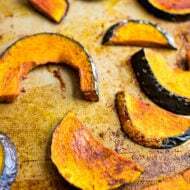 Bake for 40-50 minutes until squash is golden and flesh is easily pierced with the top of a paring knife. Let squash cool for 5-10 minutes. 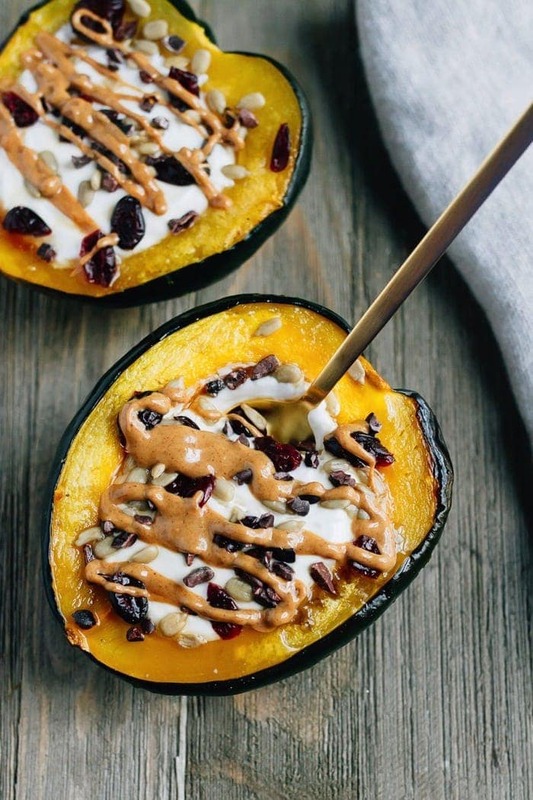 Add 1/2 cup yogurt to each squash bowl and top with toppings of choice. To save on time, you can pre-roast the acorn squash, let it cool and then place it in the fridge. Just reheat it for a few minutes when you’re ready to make your yogurt bowl. 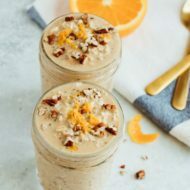 For a dairy-free version use almond, coconut or soy milk yogurt. So creative and pretty! I’ll have to make these for us soon. What is your topping? It doesnt look like maple syrup.. Thanks Sarah! The natural sweetness from the squash is perfect. This. Justin’s Vanilla Almond Butter. Sugar Free Chocolate Syrup. It’s going down! I love the idea of having squash for breakfast! Such a unique idea, can’t wait to try this! 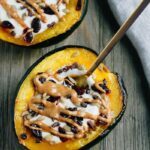 I just love stuffed acorn squash but I have never tried it like this! This is genius! Who knew veggies for breakfast could be so good! I love this idea – great recipe! What a fabulous idea for a breakfast!! LOVE this! What a unique dish! And so pretty. The perfect fall breakfast. Looks great, especially with that peanut butter topping.